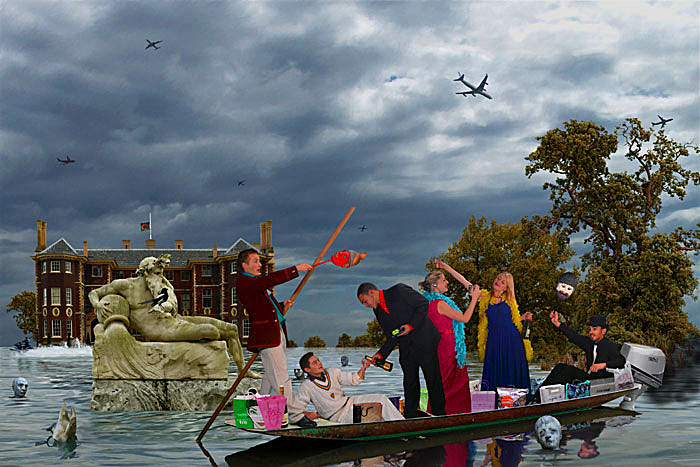 In front of Ham House a group of young revelers set off on the Thames, despite the rising waters, which are already threatening to flood the seventeenth-century building. The punt they travel in is driven by a powerful, but smoky, outboard motor. The partygoers drink champagne and play with their digital toys amidst designer carrier bags containing acquisitions purchased on their shopping expedition. Perched on the Neptune-like statue of 'Old Farther Thames' is a single magpie and floating in the surrounding waters are portrait busts from the house. Japanese knotweed has established itself as a monoculture beneath the autumnal trees. The darkening sky is crowded with passenger jets flying to and from nearby Heathrow airport. The punt is named 'Odyssey 2'.